When one first thinks about it, the fact that the year 2000 saw the debut of the Static Shock animated series feels somewhat inexplicable. In a universe in which concepts like Wonder Woman or even the Justice League hadn’t proved capable of launching a series, the fact that a book which had been in circulation only from 1993 to 1996 with no great fanfare—starring an African-American character, no less–managed to do so is nothing short of remarkable. Given how notoriously risk-averse cartoon execs can be, it is incredibly easy to imagine them passing on the pitch as soon as they heard the character wasn’t Batman, making the fact that they did not do so seem especially weird. 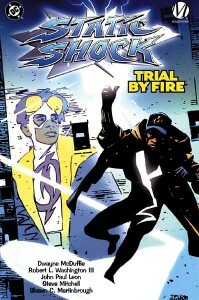 And yet, after reading Static Shock: Trial by Fire, it suddenly doesn’t seem so inexplicable. Not only are they rather good comics, the formula itself feels exceedingly familiar, being the direct descendant of the one that worked for decades for Spider-Man. Virgil Hawkins is a high school student living in the fictional city of Dakota. Occasionally, he uses his electromagnetism-based powers to fight crime as Static, a career choice which sometimes affects his civilian life, such as when it ends up costing him his job. Still, despite these costs, he carries on, because that’s what super-heroes do, and in this book, we learn his origins, see him confront his fears and some supervillains, and deal some relationship angst. What’s hard to sell about that? Unfortunately, the other cast members don’t get that same opportunity to shine. Frieda, Virgil’s best friend and confidante fares best, and the two share a good, bantery rapport with one another. Virgil’s other friends show hints of depth here and there—another friend, Felix, casually suggests that Virgil murder a bully, an invitation that our hero initially accepts; Richard, yet another friend and a ballet dancer, is seen as the constant victim of his friends’ homophobia—but not enough time is spent on either of them. Less impressive still are Static’s family members, who are both rather one-note and show little signs of potential to be anything else. Similarly, the villains don’t really manage to stand out. They make for good obstacles and good fights, but not much else. It really is Virgil’s book, and he does an excellent job of carrying it. One of the things to note about this collection is that despite featuring Static’s introduction and origin, the book still manages to not be entirely-reader friendly. The Milestone universe was designed as a shared one, which means that this book makes reference to, and features, events and characters first established outside of it. Even Static‘s origin is only half of one: The Big Bang–the event that gave Virgil and many of the other characters their powers—is shown here from an outsider’s perspective, with no explanation for why all these people are suddenly meeting, or why Paris Island is suddenly being flooded with gas is given. The absence of this additional context isn’t essential—in fact, given what we know it makes perfect sense for Virgil not to be aware or care about the full scope of what happened—but it’s still worth mentioning, because the way some concepts are introduced and then abandoned sometimes make it feel as if the book is burying the ledes in their stories. In the book’s introduction, Dwayne McDuffie mentions that artist John Paul Leon doesn’t like to look at his early work anymore, which presumably includes his pencils here. While I’m not especially qualified to judge it on technical merits, I have to agree with McDuffie’s praise for it. Sure, it’s rough in places, but the storytelling and character designs are great, and the roughness in its way feels perfectly at home with the book’s rougher take on teen super-hero stories, where students getting kidnapped at gunpoint is the middle of class is considered unremarkable. 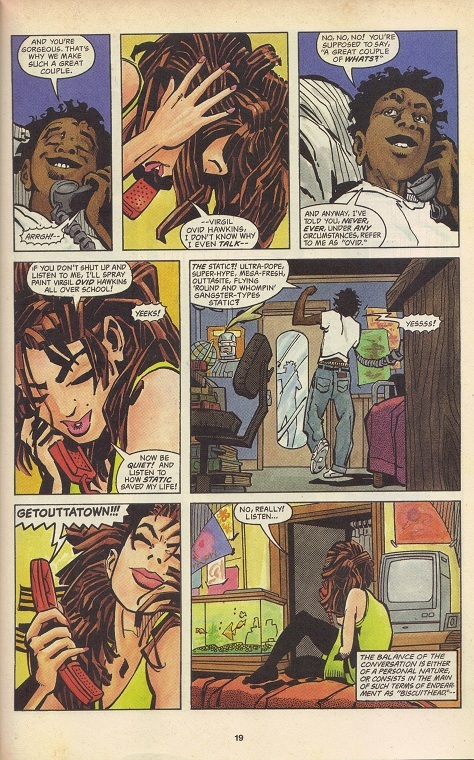 The Milestone imprint was originally conceived with the hope that it would be influential: not only would it show why stories about superheroes of color are vital, it would also provide a blueprint showing how they can be successfully written in a way that acknowledges race while avoiding the problematic and Othering depictions of the past. While it can be very hard to say how successful it was in that respect—the status quo today isn’t terribly different from what it was back then–I can say that if Trial by Fire is any indication, they did, in fact, succeed at something: they created great books, which are still worth reading, learning from, and emulating. There’s room for improvement—its striking how there really are no compelling characters here who are women of color—but all in all, it’s a very good start. While it can feel a tad dated at times—Holocaust, the villain in the fourth story, is very nineties–these are still very much recommended, and not just because of historical value. 4 out of 5. It introduces Static and his status quo and his moral struggles, so there’s quite a bit of it here, yes. While not essential, people who are interested in the background of The Big Bang can find it in Blood Syndicate #1, which also features the first appearance of the aforementioned Holocaust. Unfortunately, the book has never been collected. While there are other comics featuring Static around—including some which should be reasonably easy to find, such as the short-lived book released as part of the new 52—I haven’t read them so I can’t recommend them. Instead, I suggest Volume 7 of Blue Beetle if you want more modern-day adventures starring everyteen characters in the Spider-Man mold. Luckily, that series has been been collected in its entirety.